Sometimes sympathy card messages can be our biggest savior when we might feel overwhelmed with pain to write something meaningful. Even if we feel too confused to write something meaningful, it is important to reach out to our friends to show them that they are not alone in their pain. In times of emotional distress a few words of love and sympathy can act like an antiseptic on the open wounds of the heart. 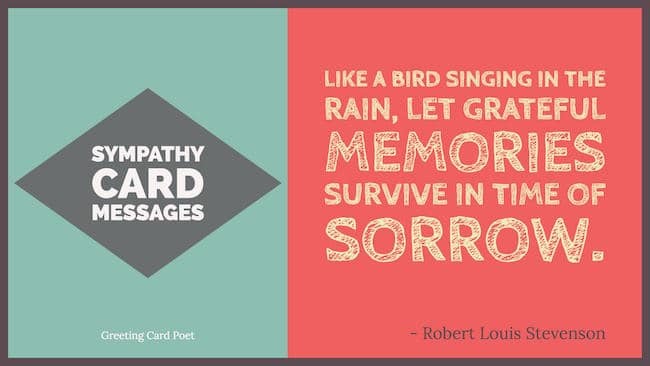 Here is a list of some sympathy card messages, which you can use in its original format or use as a reference to compose your own message. I hope you feel surrounded by much love during these difficult times. Sending healing prayers and comforting hugs. I am so sorry for your loss. Thinking of you and wishing you moments of peace and comfort as you remember a friend who was so close to you. Our family is keeping your family in our thoughts and prayers. Holding you close in my thoughts and hoping you are doing OK.
What an amazing person and what a remarkable life. I feel so lucky that I got to know him. Celebrating the life of a good man and mourning his passing with you. May the peace that comes from the memories of love shared comfort you now and in the days ahead. With thoughts of peace and courage for you. Our hearts are saddened to hear of your loss. Please accept my sincere sympathy on the passing of your father. I will always remember him as a great man that always had a kind word. My thoughts and prayers are with you. I was so sorry to hear about your father’s passing. I know this is a very sad and difficult time for you and your family. Our deepest sympathies. May you find peace in knowing that your dad lived life to the fullest. He was an inspiration to me. Stay blessed and be strong. My heartfelt condolences are with you! Everybody can be a father, but only a few can be a dad. Your father was one of the few that deserves the title. May you find comfort in all the wonderful memories you two must’ve shared. I cannot tell you how sorry I was to hear about your father. Please extend my sympathy to your mom and the rest of your family. I hope it comforts you to know that your grief is shared by all of us who knew your father. What a wonderful man! Such sad news. Your father is like a tree; the tree itself may die, but the fruit it bears will be implanted to the hearts of everyone he know. Your father is truly a remarkable person. I hope our prayers can give a little light during this difficult time. From far away, we’re thinking of you and your family. I know your heart is feeling heavy. My hope and prayer for all of you is that each day your hearts will feel lighter and lighter from the loss you are feeling, until one day only sweet memories remain to comfort you. I can only imagine how difficult this has been, and my heart goes out to you and your family. You are so young to have to suffer such an incredible loss and while time is a healer, I know that’s of little consolation now. Know that you have many, many friends who love and care about you. If you need anything I am only a phone call away. I’ve been thinking about what you must be going through, and it seems that we can’t truly understand what you’re going through until we face the same situation. But I am ready to help in any way that I can. I am so sorry for your loss, and I wish I had something wonderful to say to make you feel better. Please know that I’m willing to help you out however I can during this difficult time. I’d love to bring your family dinner or take you out for coffee if you ever need to talk to someone. Wishing you comforting memories, supportive friends and kindness from all to ease your sadness. May these flowers remind you that you are in our thoughts and prayers. We hope these flowers, in some small way, express the sympathy and sadness we feel for you during this difficult time. We’re thinking of you. Please accept these flowers and hear the words we are not able to speak. Peace, prayers and blessings. May the love of family and friends carry you through this difficult time. Our thoughts are with you. Wishing you peace and comfort, and wishing you the courage to face the days ahead. Please know that you are in our thoughts and prayers. 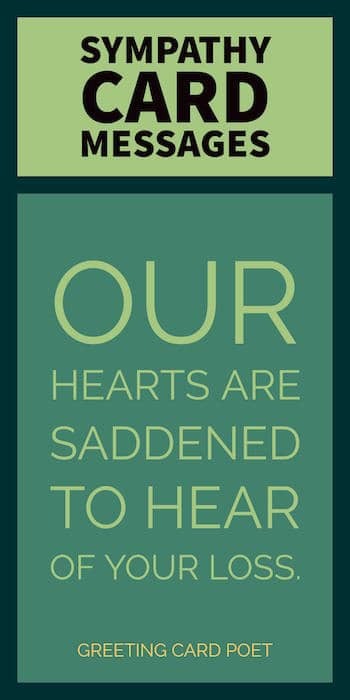 If you have any suggestions for our sincere sympathy card messages page, please let us know via the contact page. Thanks.